Helps keep floor dry and reduces slip and fall accidents and liability lawsuits. 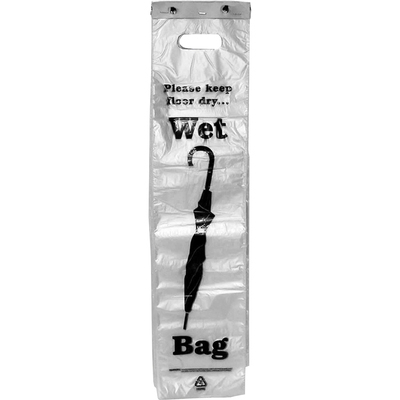 Bag offers customers or visitors a safe place for wet umbrellas. Includes die-cut handle and pocket for easy insertion or retrieval of umbrella. Ten groups of 100 bags per box. Oval shaped holes in header card allow for use with some other manufacturers' stands.